We met Ms. Nim Dem, Director (photo to the left). 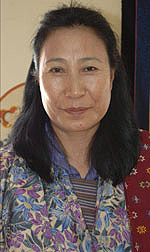 She is in charge of higher education, that is the university education as well as of adult and informal education. 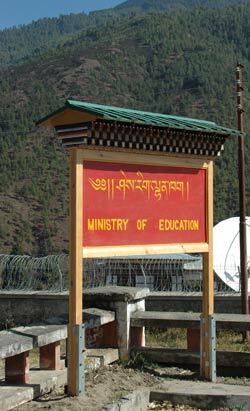 We first discussed the school system in Bhutan. It is a 12 year system, divided into primary 1-6, lower secondary 7-8, middle secondary 9-10, and higher secondary 11-12. The medium of instruction is English from the first standard. Buddhism, however, is taught in Dzongkha, the national language. They have a very ambitious system and today almost all children go to school, the ratio between boys and girls being about 55/45. But many children live far away from the schools in rural area and have a very long way to walk to reach. When rains are heavy, they are often late or miss school altogether for many days. There are 19 private schools which charge a nominal fee and are monitored by the Ministry. School books are given free to all students. At the higher level about 120 students go abroad annually for undergraduate studies on scholarships from the Bhutanese government. Included in this figure is a group 50 students who are given complete scholarships by India. In other cases some part funding is received from some countries and colleges where the students are studying. We inform about the possibilities for Master and PhD studies in Sweden. Many in the current youth generation after the age of 20 are frustrated with the career opportunities and are unemployed. It is not that there are no jobs, but their and their parents’ expectations have been high and the actual jobs offered do not match these. In this group, there is quite a wide use of drugs. So it represents a serious problem for the Bhutanese government. The schools try to provide career counselling in the higher secondary now. One important aim is to make many students return to agriculture with their new knowledge in order to introduce scientific farming. But most young people want to move to the cities. For those that have not finished school properly, the Department is setting up classes of continuing education from 2006 onwards. They have asked the private schools do this and hope that they will respond to this challenge. We inform about the Swedish Folk High School System and Ms. Nim Dem said that it would perhaps be interesting to study that and get some advice about continuing education in Sweden. We promised to host such a visit with contacts, etc. We met Mr. Bap Kesang, who is the Secretary. The Commission is organising the government administration in the country. He gave a long introduction to modern Bhutan and its development during the past 40 years. It is very important that Bhutan is understood in its proper perspective, he claims. His Majesty’s policies have been enlightened when thinking about the difficult times that Bhutan was facing a generation back. People were illiterate and there were no resources to develop the country. They had to import everything, skilled people and goods. Bhutan has received a lot of aid for this, both bilateral and multilateral. 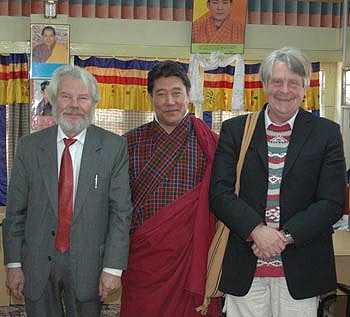 Mr Bap Kesang flanked by Prof. Staffan Lindberg and Mr. Lars Eklund, SASNET. Bhutan became member of the United Nations in 1972, and at that time the government stated that there were 1 million people in the country to avoid being treated as a very small country. The official UN figure for the population today is therefore 2.4 million. The real figure is thought to be only 750 000. A Census has just been held and the result is expected soon. Development has been rapid since then. 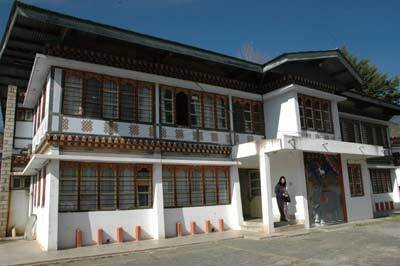 Now Bhutan adopts modern technology in al spheres and has a great many highly educated citizens, both men and women. The Bureaucracy is now being reformed from a cadre based to position classification based system. The Royal Institute of Management at the University is in charge of training the new officers. They offer masters programme in financial management, policy and public administration. Continuing education of government servants will also be provided. They are affiliated to the National Institute of Financial Management in India, but are also looking for other foreign collaboration. Mr. Bap Kesang has formerly been Bhutan’s ambassador in Geneva, which looks after diplomatic relations with Sweden. He has many Swedish friends through the active Swedish-Bhutan Society (Svensk-Bhutanesiska Föreningen), and he also knows of a few Bhutanese people married to Swedes.